Mentors Aggie Wozniak, Sheila Lucey and Fiona Meade met the girls on a cold crisp bright morning as they assembled at Cork County hall on the banks of the lovely Lee. 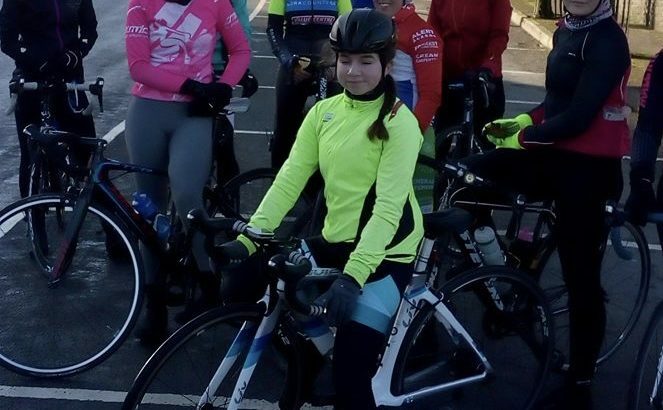 Some girls had missed the spin due to exams – but we will have a repeat of the day , and also an afternoon of bike skills and race tactics from Irish National Champion and former Pro Fiona Meade. A really massive Thanks to these wonderful Cork women for their time , effort, fun and advice looking forward to the return to the rebel county. The Women’s Commissions Munster Rep Pauline Russell launched the Girls Mentoring Program in December, and a number of elite Irish women have already added their name to helping out the up & coming young U16 riders in 2018.